Madhav claimed there was no leader in the country who can match Modi's popularity. 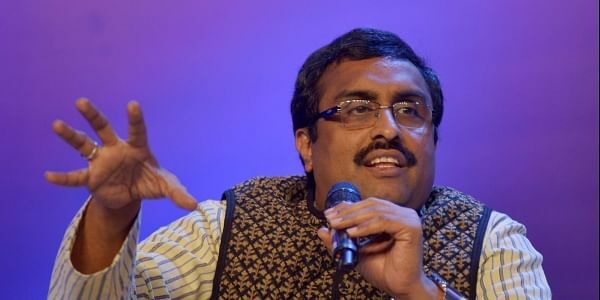 HYDERABAD: Terming the proposed grand alliance of opposition parties against BJP a "non-starter," BJP general secretary V Ram Madhav Saturday said the party is gearing up for the 2019 Lok Sabha polls with a target of winning 315 seats. The opposition parties are proposing 'Mahagathbandhan' (grand alliance) as there was no leader who can match the popularity of Prime Minister Narendra Modi, he said. "No 'jhenda' (flag) and no agenda (for 'Mahagathbandhan'). It's a non-starter. With such a sinking 'gathbandhan', nobody can stop the victory march of BJP. BJP is gearing up for parliament elections with the target of 315 seats in 2019," he said. "That's why all are doing 'Mahagathbandhan' today. There is no leader in the country who can match the popularity of Modi ji. With that fear, your Chandrasekhar Rao (Telangana Rashtra Samithi (TRS) chief and caretaker Chief Minister) has brought elections by six-eight months early," Madhav said. Madhav was addressing a meeting of BJP workers from Secunderabad assembly constituency here which was organised in connection with the December 7 Assembly polls in the state. BJP is a natural party for Telangana and only it can be the alternative to ruling TRS, he claimed. Hitting out at Congress chief Rahul Gandhi and describing the party as a "sinking ship", he said "an alliance is being formed for the assembly polls in the company of such a party." The Congress leader was "working hard on how to put Modi in power in 2019. He is very busy." Madhav said. Attacking TDP, which is also a partner in the Congress-led alliance of opposition parties in Telangana, he described the party as 'Telugu Droham (betrayal) Party'. TDP was founded by late N T Rama Rao on an anti-Congress plank and the party is joining the Congress-led alliance for political existence in Telangana, he claimed. BJP activists should aim to bring the party to power in Telangana and not hope to increase its strength by just a few seats in the assembly elections, Madhav said. TRS had only got 62 seats (out of 119) in a wave in 2014 in when the party ran a campaign claiming credit for realising separate Telangana, the BJP leader said. "Does TRS, which could not run the government for full five years, have the eligibility (to be in power) in the state," he asked. BJP MP from Secunderabad Bandaru Dattatreya, state BJP president K Laxman and others were present on the occasion.